So you want to event! 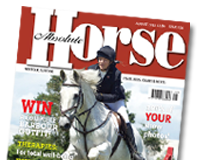 Our February edition includes details of the Under-18 programme throughout the East of England as well as top rider interviews with Francis Whittington and Lucy Wiegersma, as well as a great tutorial from Sharon Hunt and advice from Sarah Bullimore about how to find you perfect event horse. `plus Lucinda Fredericks illustrates how to adjust your body protector and Gemma Tattersall shares her top tips for the coming season.